According to analysts at Piper Jaffray, Android's share of the tablet market will grow to 39% by 2012, trailing Apple's 44% market share. Apple's sole tablet offering, the iPad, has dominated the market for much of 2010, comprising 95% of all tablet sales in Q3 of 2010. 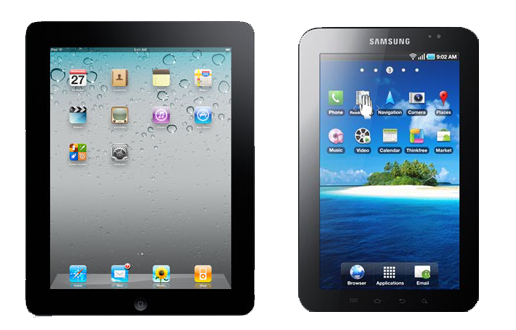 Currently, the strongest competitor to Apple's iPad is the Samsung Galaxy Tab, running Android 2.2. Since, its launch in early November it has sold 1 million units and is projected to sell 1.5 million units by the end of 2010. Android tablets on the market today include the Dell Streak (half phone/half tablet), the ViewSonic ViewPad 10, the Archos 101 Internet Tablet, the eLocity A7, and others. iSuppli predicts that Apple will sell a total of 63.3 million iPads in 2012. In contrast, the analysts at Piper Jaffray puts the total number of tablets sold in 2012 at 70.8 million, with Google and Apple having 39% and 44% of the market share, respectively. Whichever figure is to be believed, the success of the Samsung Galaxy Tab demonstrates that there is a market for Android tablet users, and with a number of new Android tablets set to enter the market early next year, it is likely that Android's market share in this demographic will increase dramatically in the next few months. Let's also not forget that Android is not yet optimized for the tablet form-factor, and the introduction of Honeycomb next year can really kick things up into high gear. I should point out that Piper Jaffray does not have the best track record, so all their "predictions" are to be taken with a large grain of salt. It is also quite impossible to say just how much the tablet market will change in the course of 2 years, as technology evolves at mind-boggling levels in this fast-paced sector.